Rive Roshan was invited to take part in the final exhibition of the year at the Aram Gallery. For this exhibition, called Joints + Bones, Loom Bound was selected as a modular partitioning system that uses bands of Kvadrat fabric as a hinge and a joining element. Rive Roshan has created a special edition of Loom Bound for this show, made as a response to the modernist icons seen in the Aram Store, and in particular to one of the ‘De Stijl’ icons – Rietvelds’ Red and Blue chair. 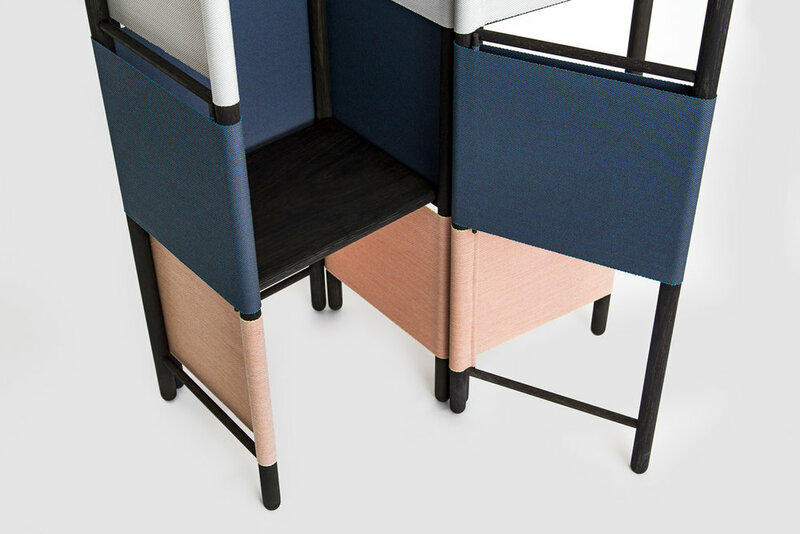 It features a naturally blackened oak structure that creates a striking contrast between the wooden structure and coloured fabric panels highlighting the joints and bones of the architectural divider. Fabric is used as a hinge and a constructive joint for the oak components in this partition system. Loom Bound is a modular design, and the partition can be extended, adapted or configured to suit a particular space. The design can be used to divide spaces, improve acoustics, create storage or areas of privacy. A special 'De Stijl' edition of Loom Bound by Rive Roshan, specially made for the Aram Gallery in Covent Garden, London. An homage to Gerrit Rietveld and Theo van Doesburg. Joints + Bones investigates the structure and connections of design, as opposed to surfaces or skins. An international mix of emerging and established designers have found innovative, beautiful and experimental ways of joining elements to make furniture and structures with varying scale and scope. Some exhibits make the mechanics of their joinery explicit, asking us to look at how construction can lead to overall form or rationale. Tension, pivots and bespoke 3D-printed parts are some common means with playful possibilities. Other projects investigate new methods of combining materials, often with an unusual agent employed to do the joining: a stretch of fabric, a hose clip, or shrunken plastic bottles as a rudimentary graft. Exhibits vary from decorative screws and cable ties, to modular structures that can repeat to fill whole rooms. Alongside these works, is a set of complementary exhibits that are inspired by bones and anatomy in more abstract ways. Translucent textile hangings that remind of X-rays, crockery in bone china, elastic ligaments that hold lids to their containers, and skeletal structures grown by fusing powder around hot wires. Encouraging a deeper appreciation of design, Joints + Bones looks at how methods of joining can go beyond an essential role and give a piece of design its logic, originality and character. Dedicated to promoting understanding of contemporary design, The Aram Gallery aims to inspire both a design and general audience with its investigative approach to an exciting theme.